How Optical Smoke Detector Work ? smoke-detector-1An optical smoke alarm (also called photo-electric smoke alarm) works using the light scatter principle,. The alarm contains a pulsed Infra red LED which pulses a beam of light into the sensor chamber every 10 seconds to check for smoke particles. smoke-detector-2When a fire breaks out smoke will enter the optical chamber through the opening vents. Smoke alarms from quality manufacturers have the chamber protected with insect screens to stop bugs entering and causing false alarms. smoke-detector-3As the smoke enters the optical chamber, its particles cause the Infra red light to be scattered onto the photodiode light receptor. smoke-detector-4Once the scattered light hits the photodiode light receptor a signal is sent to the integrated circuit which causes the alarm to sound alerting the occupants to the fire.An optical smoke alarm uses the principle of light sensors to identify the smoke and hence, detect fire. It consists of LED lights (light emitting diode), a lens and a photodiode. Let’s know how light helps to detect a fire. A light emitting diode is a semiconductor device that operates on the principle of a diode. 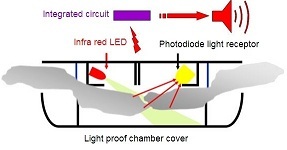 When the diode is forward biased, recombination of holes and electrons take place, thereby releasing energy in the form of light.In normal conditions (when there is no fire or smoke), light from the light emitting diode passes the detector in a straight line and so the alarm is not triggered. A lens is provided in the optical smoke alarm device to direct the light source in the form of a light beam. In the events of a smoke, the smoke particles fill the smoke alarm and due to the presence of the smoke particles, the light beam gets deflected from the straight line path. The deflected light beam strikes the photoelectric sensors (photodiodes) and thus the alarm is triggered. You must be thinking what is a photodiode? Well, a photodiode is another form of diode that become active when a light beam (photons) falls on it. These alarms are also called photoelectric alarms. 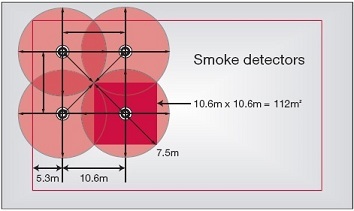 When mounted on a flat ceiling, smoke detection devices have an individual coverage of 7.5m radius. However these radii must overlap to ensure there are no “blind spots”. Therefore individual coverage can be represented by a square measuring 10.6 X 10.6m giving an actual coverage area of 112 m² per device.